Sarah and I were in Pittsburgh for Quilt Market where we stayed at the downtown Westin. When the elevator stopped on our floor there was a man dressed in business attire already on it. I looked over at him and could see tears welling in his eyes. By the time we got to the second floor to get off, the tears were rolling down his checks. My first impression was maybe he just got fired from his job. Then I thought maybe he was in town for a funeral. As Sarah and I walked off, he came over to us and asked if he could share something. He could barely get the words out but managed to tell me that he and his wife had been expecting their fourth child, a girl, and they knew she had Down syndrome but his wife miscarried three weeks ago. My natural reaction was to give him a hug and tell him how sorry I was. His reply brought tears to my eyes, too. He said, “Thank you for saying that. Everyone else is telling us it was the best thing that could have happened. I see your daughter and she is beautiful.” I was at a loss for words so I gave him another hug and then we went our separate ways. But I thought about that interaction all weekend. Why are people so afraid of Down syndrome that they would tell a grieving family it was for the best? ~A post in my Facebook feed this past spring. My essays on Whoopsie Piggle have, by design, emphasized how having a child with Down syndrome is little different than having a child without Down syndrome, which is also why not all my essays focus exclusively on my daughter Lyra and her DS. I read somewhere that we are all on the path of disability whether caused by age, illness, accident or an extra chromosome. Tangentially, I have discussed medical issues that are more common in people who have Down syndrome, most particularly vision issues as Lyra was born with bilateral cataracts (occurring in 3% of newborns who have DS versus .03% of those born with 46 chromosomes). More recently, and painfully, I have written about the congenital heart problems that affect approximately 40% of the population with Down syndrome. Before this summer, I had met so many babies and young children who had undergone successful heart surgeries that I unintentionally dismissed the gravity of these cardiovascular diagnoses. And then three babies, all the same age as Lyra, died in just one week this past June. I wrote about babies Ryder, Fiona and Annie in “A Painful Week in the Down Syndrome Community.” Without rescinding my position that having a child with Down syndrome is little different than having a child without DS, I believe it is vital to discuss the possible medical complications that can accompany a diagnosis of Down syndrome. Why? Because uninformed fear causes people to say hurtful things. Because poorly informed medical personnel say fear-driven, and largely inaccurate, things when giving an expectant mother the news that the child she is carrying has an extra twenty-first chromosome. Because in some parts of the world, including regions in the United States and Canada, the Down syndrome population is undergoing a quiet campaign of genocide. In my last essay, I wrote about traveling in Spain this summer with my oldest son, Claude. Watching my firstborn become a fully-fledged adult has made me ridiculously emotional. I don’t think of myself as a crier. As a child I learned not to cry at all costs. I rediscovered my tears when I became a mother, but in the past two years, I surprise even myself with sudden and unpredicted weepiness. I mentioned crying as I told a Starbucks barista in Barcelona how delightful it was for me, a mother of a child with Down syndrome, to see the respectful and fun relationship the café employees had with their team member who has Down syndrome. What I did not write in that essay was that every morning in Spain, every single morning, I cried. Most mornings, Claude rose and went for a run, leaving me to shower and get dressed. Before I did, however, I’d pull up Facebook on my phone while still lying in bed and weep over the pages of the babies who had died the week before I’d joined Claude in Spain. After her first heart surgery more than a year ago, Fiona’s remarkable parents created Fiona’s Hope Totes, which has its own Facebook page. This non-profit delivers care packages to families in Minneapolis/St. Paul who are experiencing an unexpectedly extended hospital stay with a sick child. The day before she died, Fiona’s family posted an urgent request for prayers as Fiona had been rushed back to the hospital due to complications after a second heart surgery. In the weeks after she died, that post requesting prayers remained the last post on the page, like a scream that wouldn’t fade as the family privately grieved. Baby Annie’s doctors would not place her on a heart transplant list, whether due to complicating medical issues or the fact that she had Down syndrome remains ambiguous (that there is discrimination against the developmentally disabled getting organ transplants is not ambiguous, the subtle discrimination is real). Annie’s parents opened their lives to the world on her Facebook page, Annie Golden Heart. When I learned of her situation, Annie was alive, but in hospice attended by her parents and two sisters. Each day, I followed her page, hoping for a miracle, hoping as her story drew substantial attention from people worldwide that someone, somewhere would find a way to save that baby. Instead, day-by-day as I and countless others watched, Annie grew bluer, more lethargic and puffy. And then she died. In Spain, I saw the daily posts of a family submerged under and shattered by grief. Pictures of a baby’s grave more preciously decorated than any child’s bedroom, photos of a healthier Annie just months earlier including a collage of the once smiling tot with vibrant red hair and the facial features of her daddy. However, the photo that made me touch my iPhone screen with my finger, as though I could pass comfort through my device, was of Annie’s oldest sister with her face painted to look like a tiger. The caption read: Today is Nicole’s 9th bday. She has been a great sister to Annie. We are so thankful to Marie for taking the girls out today to have fun since it’s still very hard for us to even leave the house. Happy Birthday, Tiger!!!! Only recently did I learn that baby Ryder had group B meningococcal disease, the most common strain of bacterial meningitis found in the United States (though Ryder did not live in the U.S.). I have found no evidence that having Down syndrome makes a person more susceptible to meningitis or the consequences of the disease more severe. What Ryder’s family is going through I would not wish upon anyone, but his Down syndrome had nothing to do with his death. I carried those babies, Fiona, Annie, and Ryder, with me as I traveled Spain with Claude. 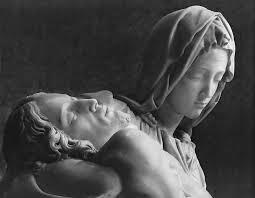 When we visited churches, I looked for La Pieta stations in which Mother Mary holds her dead son, Jesus, just after he’s been removed from the cross. When I found them, I lit a candle for those families. You do not have to be Christian, only human, to feel the emotions of that station in Mary’s life. It’s easy to imagine for centuries parents who have lost a child have found La Pieta a sanctuary of familiars. When I returned to the States, I was too busy to look at Facebook for a few days. When I did, I saw that Annie’s page had been taken down and Fiona’s Hope Totes had resumed. Fiona’s valiant family was once again delivering care packages to families. Everyone’s journey with grief is unique and there is no accepted protocol except to grieve. A few days later, Annie Golden Heart was again a page on Facebook. I found Ryder’s page and his parents and two older brothers have taken Ryder’s favorite toy, Bear-Bear, traveling with them and posting photos of the white bear at an aquarium, a theme park and in the arms of Ryder’s older brother who took Bear-Bear to bed with him for comfort. Most babies born with heart defects survive due to surgical corrections that have, in most parts of the world, become routine procedures. But sometimes babies born with congenital heart defects, both with and without Down syndrome, die. And the parents who lose children with Down syndrome grieve every bit as much as other parents. But what about the children with Down syndrome who live? Most, but not all, babies born with Down syndrome have developmental delays. Meaning, things just take longer and sometimes more support is required along the way. Though hitting developmental milestones later than their peers without DS, most people with Down syndrome will walk, talk, dress themselves, read, go to school, graduate high school, cook, receive post-high school education or training, get jobs, fall in love, live independently, grow old and, like us all, one day die. That is “typical” life with Down syndrome. But what about the babies who face medical challenges beyond developmental delays and heart defects?A friend recently posted that she worries about telling people her son with Down syndrome has seizures. She is glad “he’s alive and he’s mine” but fears that someone else expecting a baby with Down syndrome who knows her son has seizures may chose an abortion based upon his case. Another friend told me about a woman who is a single mom of a boy with DS who is probably deaf, cannot talk, and cannot walk. We, in first world countries, live in a medically miraculous time. A time unlike any known to humanity, in which death does not often visit us until we are middle aged. My ex-husband’s family lived for well over a hundred years in a small town in southeastern Ohio. Over the years, I heard stories of an ancestor named Flavia. Born in Germany, she studied music and had been introduced to at least one famous composer. In their tiny town in Ohio, Flavia taught music to children and had a parrot that often provided vocal accompaniment. On a visit back home (as my ex-husband used to call it), his aunt told us that Flavia’s gravestone had been vandalized and repaired. Later that afternoon, we stopped at her grave, which we had learned only that day was very near the city’s brick firehouse. I have no recollection of Flavia’s gravestone; I only remember the two stone lambs carved in marble on top of much smaller gravestones next to Flavia’s. Cholera claimed two of her children, ages four and six, in one summer, something nobody had ever mentioned. In the nineteenth century childhood death was not remarkable, yet families grieved as deeply as they do today. Visit any cemetery that dates back before the existence of antibiotics and you will find entire sections devoted to children, families who birthed eight, ten, or more children only to bury all but one or two. Overwhelmingly, modern medicine is good, but not everything can be fixed. In the typical population, children are born regularly with, or later develop, learning disabilities, autism spectrum disorders, seizures, cancer, mental illness, vision and hearing difficulties. As of now, and unlike Down syndrome, these conditions cannot be detected with prenatal testing. However, that will likely change. And when it does, what will then be considered acceptable? Who defines which babies are perfect enough to be born? In human history, one need look no further than the past century to find pernicious programs to reduce or eliminate certain groups. Black women in the United States were frequently sterilized without their knowledge or consent. The Nazis target Jews, gypsies, homosexuals and the developmentally disabled (among many others) for systematic elimination. As the child of Christian missionaries in China, Pearl S. Buck regularly found the corpses of female newborns who had been discarded like trash. Looking back, this much is clear: once a society has decided that certain groups are not equal or good enough to exist, that decision is never static. If today it seems reasonable to seek a society free of members with Down syndrome, I guarantee that in the near future, particularly as prenatal testing begins to tease out more and more pre-existing conditions or potentials, the slippery slope of genocide will expand. Making abortion illegal won’t stop the termination of pregnancies where the fetus has Down syndrome any more than it would end abortion for fetuses with 46 chromosomes. In Ireland, where abortion is illegal, the abortion rate for pregnancies where the fetus has tested positive for Down syndrome is 50%. 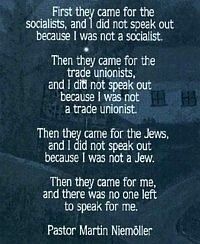 Once we’ve chosen as a society to decide who is human enough to live and who needs to be eliminated, watch out. Any group could be next. Unbiased, accurate information is every woman’s right when receiving a diagnosis of Down syndrome for her fetus or newborn. In the U.S. we know, based upon statistics, approximately how many babies should be born each year with Down syndrome. But, on average, only about half as many are. For several years in Denmark, aggressive prenatal testing accompanied by counseling that encourages aborting fetuses with Down syndrome has brought the rate of Down syndrome termination to a consistent 90%. In France, it’s over 80%. In early June, before all those sweet babies left us, my partner Max and I went to a party. We brought four of our children, Hugo, Jules, Leif and Lyra, to the family-friendly event at a beautiful home with a sprawling yard. I had a fabulous conversation with a woman who was smart and funny. After a long conversation, we separated and then reconvened. Lyra was nearby hustling around on all fours with her newly-perfected bear walk. “Wait, your daughter has Down syndrome?” the woman asked, looking astonished. “Oh, yes,” I said. To me it is obvious Lyra has DS, but I am now firmly located on the inside of the larger community of those who have family members with DS and can recognize it more readily than I could before Lyra was born. “I have no judgment,” I said, knowing this woman made the best decision she could with the information she was given. I then watched the features on her face rearrange themselves, her eyes going from narrowed and intense to wide and open. “But I see your daughter and,” she paused, “it makes me wonder.” I gave her my card, but not surprisingly, I never heard from her. In five minutes, I watched a woman think she could not have possibly raised a child with Down syndrome to wondering deeply, perhaps painfully, what her life really might have been like as the mother of a child with Down syndrome. It is tragically ironic that at a time when we better understand Down syndrome as a range of developmental delays and that those who are diagnosed with DS often positively respond to appropriate interventions, the termination rates in pregnancies with a diagnosis of Down syndrome are escalating to an alarming degree, in some places to the point of annihilation. We have the knowledge to diagnose and remediate Down syndrome but far too often, the message given with the diagnosis over-emphasizes worst case scenarios or contains information that is ridiculously inaccurate. (See the opening quote of “Fully Human and in Need of a Civil Rights Movement.”) Medical professionals, whose job it is to know the latest research findings, are not always giving scientifically accurate and balanced accounts of what it means today to be born with Down syndrome. In fact, statistics suggest that more often the opposite is true. My own understanding of Down syndrome has dramatically changed since the birth of my daughter. What I once saw as the reality of life with Down syndrome I now realize was based upon meeting people who had spent their entire lives, often beginning at birth, in institutions. My daughter stands on the shoulders of the past two generations of people born with Down syndrome who have been raised at home and in their communities, many of whom have worked with physical therapists, occupational therapists and speech therapists. Just as with her brothers, we expect Lyra to strive, even work hard, for all she can accomplish while we support her efforts in any way we can. The National Down Syndrome Society: With the mission “to be the national advocate for the value, acceptance and inclusion of people with Down syndrome,” NDSS often takes the lead on legislative issues such as the ABLE Act (read about the ABLE Act in “Miss Lyra Goes to Washington“). NDSS is the national sponsor of the Buddy Walk, a fundraising and awareness campaign that takes place each year in cities across the United States. Our local support group, The Upside of Downs, is an affiliate of NDSS. Down Syndrome Diagnosis Network: This newly formed organization was created by a group of Mamas who have babies the same age as Lyra. DSDN’s long-term goals include filling in the gaps of inadequate support systems. In addition to supporting new families, DSDN is focused on changing the diagnosis conversation with the vital mission to help “parents give their medical providers feedback on the quality of their prenatal or birth diagnosis conversation. DSDN provides health professionals the necessary resources in order to deliver future diagnoses with unbiased information and support.” Read: gatekeeper education campaign. The work of DSDN is paramount, now more than ever. The National Center for Prenatal and Postnatal Down Syndrome Resources: Complementing the work of DSDN, this organization is a clearinghouse of the most up-to-date information regarding Down syndrome. Furthermore and significantly, this organization tirelessly advocates for legislation, state-by-state, requiring accurate information be given with a diagnosis of Down syndrome. For information on the various states that have passed legislation requiring accurate information to accompany a DS diagnosis, and how it has been carried out, read this. Along with the families who lost their babies this summer, I have thought frequently about the woman I met at the party who had terminated her pregnancy. Her desire for a baby had to be substantial as IVF is a painful, lengthy and expensive process. But then she was given frightening information and the directive to decide in two days what she would do. Knowing what I know now, I can only wonder: What if she had met Lyra before she received the diagnosis? What if she—and thousands of expectant mothers like her—had been given accurate information along with resources for support? I cannot help but believe, based upon the change I saw this woman undergo in five minutes, that today she would be the proud mother of a child with Down syndrome. And if all women were to receive the full and unbiased information that they deserve as autonomous adults, would we then be closer to a society that values the human rights of its Down syndrome citizens, rather than one that tacitly endorses the elimination of that population? I believe that, yes, we would. This entry was posted in Lyra's Latests, Uncategorized and tagged accurate information given with Down syndrome diagnosis, Annie Golden Heart, congenital heart defects with Down syndrome, Down Syndrome Diagnosis Network, Fear of Down syndrome, Fiona's Hope Totes, genocide of people with Down syndrome, La Pieta, medically fragile children with Down syndrome, more alike than different, National Down Syndrome Adoption Network, National Down Syndrome Congress, National Down Syndrome Society, T21 Ryder's Foundation, The National Center for Prenatal and Postnatal Down syndrome Resources. Bookmark the permalink. This makes for very good reading on the dangers that devalued poeple (such as people with DS) face in medical systems.